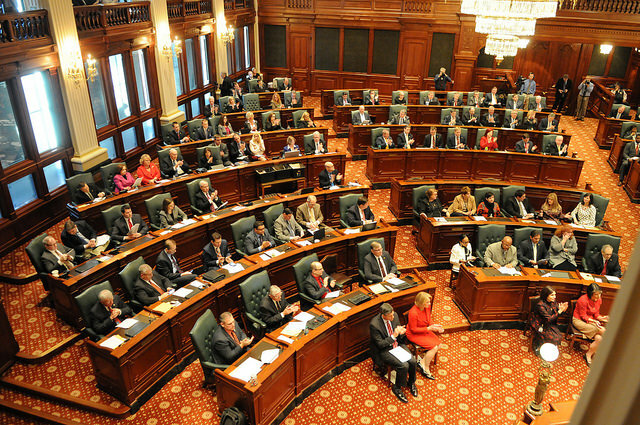 MACOMB –Following Governor Rauner’s second Budget Address, Rep. Norine Hammond (R-Macomb) urged for bipartisan commitment to resolving the budget impasse that has consumed Illinois for nearly nine months. “I agree with the Governor’s call for an urgent resolution to our budget impasse. It is beyond unacceptable that we have not reached a bipartisan resolution to this impasse,” Rep. Hammond said on Wednesday. Governor Rauner presented his annual budget address as a strong call to end the budget impasse of the past nine months. The Governor presented two possible pathways toward resolution- one in which legislators simply give the Governor unilateral power to make all the budget cuts necessary to balance the budget, or an alternate plan including a mix of economic reforms, cost reductions, and broadening the revenue base. “The Governor called for a balanced budget with a mix of reform, cost reductions, and new revenue. By presenting this pathway, along with an alternate pathway of simply continuing drastic cost reductions, the choice is clear to me that a balanced approach is far more preferable than the path we have been going down over the past two decades,” continued Hammond. Hammond encouraged residents of the 93rd district to contact her with questions or concerns on this or any other state issue. Hammond’s Macomb district office can be contacted at (309) 836-2707 and she can be reached via e-mail at rephammond@macomb.com. Constituents can also visit her legislative website at www.norinehammond.org to sign up for her electronic newsletter. Hammond represents all or part of Brown, Cass, and Fulton, Knox, Mason, McDonough, Schuyler, and Warren counties.